A great university is built by great faculty. In just more than 50 years, we've grown to become the nation's second-largest university, with researchers and professors whose impact reaches far beyond our Orlando backyard. Our faculty touch countless lives, nurturing future leaders and thinkers in everything from engineering and health sciences to education and digital arts. And now we have an unprecedented opportunity to build on our strengths by hiring 200 faculty members to join us by Fall 2015. We’re excited to be hiring research, teaching and clinical faculty in each of our 12 colleges and in more than 60 departments across campus. 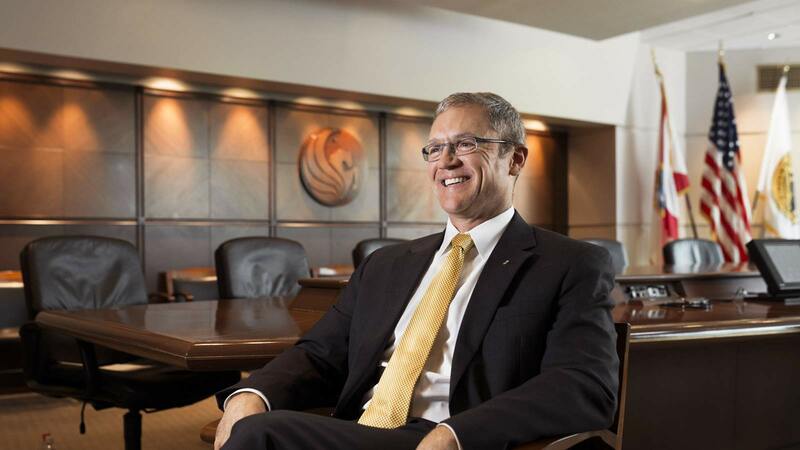 Of UCF’s 200 faculty hires, 100 positions will replace departing or retiring faculty members. The other 100 hires are new faculty positions — almost all tenure or tenure-earning — made possible by state performance funding awarded to UCF in part because of our high graduation rate, admissions standards and graduates’ success in landing high-paying jobs. The new positions will address areas where UCF has experienced high-enrollment growth over the past decade, including the rapidly growing science, technology, engineering and mathematics (STEM) fields. UCF awarded nearly 2,000 undergraduate degrees in STEM fields last year — the second-largest number in the State University System of Florida. We expect to hire another 100 faculty members for the 2016-17 academic year, contingent upon additional state performance funding. These new faculty members will help enhance the university’s areas of strategic emphasis, such as emerging media, big data and sensor networks. They may help us lead newly created faculty clusters — interdisciplinary teams of faculty members that we are developing to research and teach issues of local, national and international relevance. Similar faculty clusters at other leading research institutions are exploring topics such as biophotonics and digital humanities. Bringing in new faculty members means exposing students to new academic opportunities, new ways of learning and different lived experiences. It’s part of becoming more inclusive and diverse — one of President Hitt’s five goals — because diversity among our faculty, as much as among our students, enhances excellence in everything we do. Ultimately, each new faculty member will join us to help shape the next 50 years, making an even greater impact on our students and community. Click here to learn more and apply for faculty employment opportunities.